Piiroinen took a part at Sportec fair, which was hold in Tampere 27.-28.3. Sportec and Gymtec together with the new Welltec is the largest professional trade fair in Finland for industry of sports, sports facilities, landscaping, maintenance of recreational ground, fitness and health exercise. 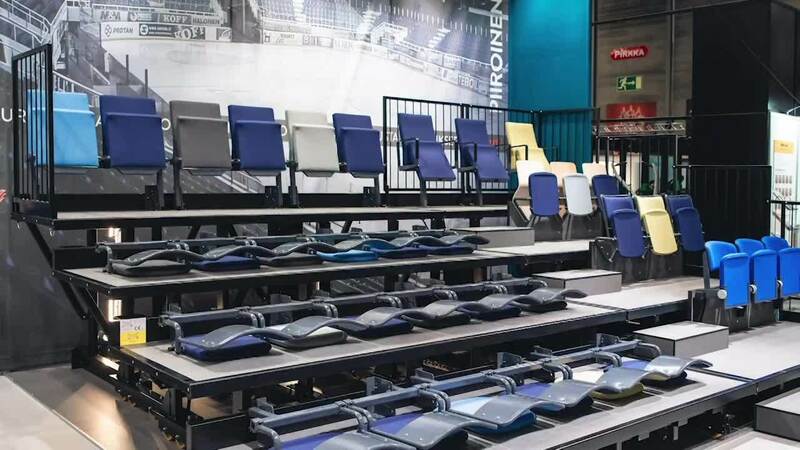 The exhibition gave us the opportunity to introduce fixed and telescopic tribunes systems with several different seat models. Thank you for visiting our booth there! Our booth at Sportec fair, Tampere, 2019. Take a look at the telescopic system in action. Full welded frames of tubes. Operates with rigid chain, the system does not depend on floor traction. A retractable sesting system will always be opened and closed in a perfect way. Wheels are heavy industrial load wheels, size and number designed for each project. As a result, gentle for floor materials and maintenance free. Telescopic tribune was made by our exclusive partner, that specialize in the design and manuifacture of retractable seating systems. Comfortable and long-lasting seats suitable for ice halls and multipurpose arenas. Innovativeness - new design and materials e.g. composites. Loose furniture for the arenas. You can have so much fun with our goal-bench! The telescopic tribune showed at the fair will be available in our showroom in Helsinki in late April. You are warmly welcome to visit us and to take a look at it! 720 cm long and 340 cm deep mobile seating tribune for outdoor use (61 seats). We thank you for the inspirational discussion and we will get back to you as agreed. Meanwhile,please, do not hesitate to contact us.